Beautiful vineyards on the south western border between Fleurie and Beaujolais-Villages. Recently I had a quick trip to Beaujolais as the guest of Henry Fessy and it was a really uplifting experience. I have only been to Beaujolais once before and had come to the view that, with exceptions, the place was generally nicer than the wines. Now I am not so sure as I tasted some fabulous wines from this Cinderella-like region. Too many Beaujolais wines in my younger days had almost no aromas or flavours at all except that bubblegum and candy floss character that shows the grapes were not crushed and instead the fermentation was carried out by the maceration carbonique process. I can enjoy wines made this way, but usually do not, especially if they are made from Gamay – the black grape of Beaujolais. Too much of Beaujolais in my past was Beaujolais Nouveau too. This new wine is released in the year it is harvested – on the third Thursday of November. I am sure there are good examples, but on the whole it is very light, very thin, very acidic and, again, tasting of bubblegum, candy floss and cherryade. It is not everyone’s idea of fun and has tainted appreciation of the whole region for many of us, including me. Which is a pity because Beaujolais is about so much more. Beaujolais can be a surprisingly complicated place for a region that has traditionally achieved most of its fame from producing very approachable wines. Firstly, although the focus is on the reds, there is a tiny amount of white Beaujolais produced. Made from Chardonnay these white wines are very good quality and well worth seeking out. Wine Map of France showing the position of Beaujolais just to the south of Burgundy, but only semi-detached in some ways – click for a larger view. Secondly, Beaujolais has traditionally been regarded as part of Burgundy, in the UK anyway. So much so that in a former life when I sold Georges Duboeff’s Fleurie, in tiny letters it stated “Grand Vin de Bourgogne” on the label. Nowadays Beaujolais is mainly regarded as a region on its own and not a sub-zone of Burgundy. However this isn’t entirely consistent as there is no such thing as Crémant de Beaujolais for instance. Instead they produce Crémant de Bourgogne. The northern border is somewhat imprecise too with the Mâcon appellation / PDO encroaching all the way down to Romanèche-Thorins in the north-east of the region and even overlapping the Beaujolais Cru of St Amour. Just to confuse matters a little bit more of course there are some odd labelling laws that permit some producers to label wines made from their Beaujolais vineyards as Appellation Controlée / Appellation d’Origine Protégée Bourgogne whilst denying that to others – this is why you can have Gamay de Bourgogne for instance, and very good it can be too as the grapes have to come from the Cru vineyards of Beaujolais – see below. 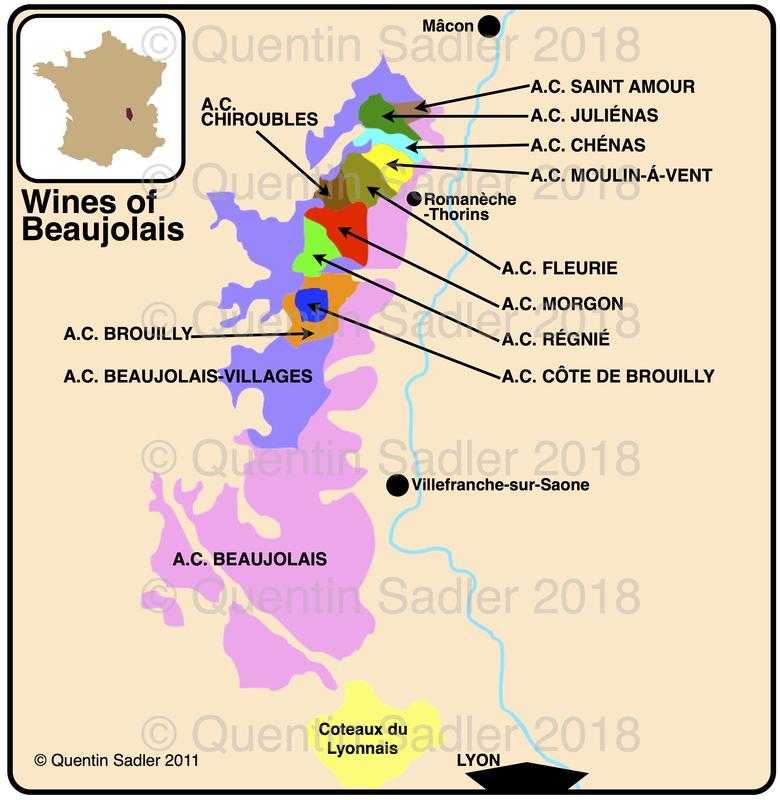 Wine map of Beaujolais showing all 3 quality levels and all 10 Crus. Basic AC Beaujolais – this is generally grown on chalky limestone and produces very light reds with high acidity. AC Beaujolais-Villages – from the northern part of the region where the soils can produce richer, rounder wines. The 10 Crus. The Cru wines are named after the village – with 2 exceptions – within whose boundaries the grapes are grown. The appellation / PDO makes no mention of Beaujolais, just the village name. The most famous of these is of course Fleurie, but there are ten in all – see the map above. The mill in Romanèche-Thorins after which the wines of Moulin-à-Vent are named. The two exceptions that are not named after their village are Côte de Brouilly which is named for the slopes of Mont Brouilly, an extinct volcano, and Moulin-á-Vent which is named after the distinctive old windmill that stands amongst the vines of Romanèche-Thorins. With classic French regions it is quite a good idea to visit a producer who makes from the entire area, because you get an overview made by the same hand and mindset. That is what I got at Henry Fessy and it really made me revaluate my thoughts on Beaujolais. Laurent Chevalier, the charming director at Henry Fessy. Henry Fessy was a family run estate from 1888 until it was purchased by the great Maison Louis Latour of Burgundy’s Côte d’Or, who are still family owned after more than 200 years. The 70 hectare Fessy domaine has been run by the genial Laurent Chevalier ever since, with some help from members of the Fessy family, and it provides a wonderful snapshot of what Beaujolais can do. They own land across the region and produce every single appellation contained within Beaujolais, as well as wines from the Mâconnais in southern Burgundy and even a very attractive Rosé de Provence. Currently they farm in 9 of the 10 Crus with Chiroubles being the exception. They do however produce an excellent Chiroubles from an estate with which they have long term contracts for supply and control of the vineyard. Laurent explained that they handpick the best sites and destem 80% of the grapes, leaving 20% whole bunches. Old fashioned Beaujolais is not destemmed as the grapes have to be whole for maceration carbonique, so is fermented on the stems. 30 or 40 years ago those stems would not be as ripe as they nowadays, for many reasons, and so the results could be stalky and green. Nowadays greater control means that using stalks is a real choice because it can help with the manipulation of the must and also in the development of fuller wines and silkier tannins – providing those stalks are ripe. So, by definition here they are not using maceration carbonique. Instead they do very light macerations with not very much wood, just a little for the top crus. What they are looking for is the taste of Gamay, rather than the more recognisable taste of bubble gum from the maceration carbonique. The big differences between the different parts of Beaujolais are soil and aspect – isn’t that always the case! In the south the gentle rolling hills of most of the AC Beaujolais are lighter, chalkier limestone which produces lighter more acidic wines. The north however has a more complex arrangement of mainly granite with some schist, volcanic basalt and manganese. These all produce richer, rounder, more complex wines. Add aspect into the equation and you can quickly see why the Crus are so different from the rest of the region. Fleurie’s Chapelle de la Madone was built around 1870 to ward off vine diseases. It seems to have worked! We talk about the slopes of Burgundy’s Côte d’Or and some other places too of course, but generally the Crus of Beaujolais are not spoken about in the same hushed ones. Well they should be. They are easily the equal of the Côte d’Or to look at, more beautiful if anything, with lovely dramatic slopes often angled towards the sun. In fact where the Cru of Beaujolais score over their neighbours to the north is that here the slopes do not only face one way as they often form a ridge with a reverse slope too. So you can have south, east and west facing Fleurie, and other Crus, vineyard slopes for instance. That rounded hill is Morgon’s Côte du Py lieux-dit. Fessy blend the fruit from their part of the Côte du Py into their Morgon rather than bottle it separately. The soils here are a mixture of granite and schist, decayed slate. The different soils of the various Crus are important too as the best wines can be very mineral and make you certain that you can taste the various soils in the wines. Some people believe that happens, but most science points to something else explaining minerality in wine. A function of acidity perhaps? My own feeling is that it is a mixture of acidity and a lack of dominating, rich fruit. We are used to so many red wines being big and bold with rich primary fruit characters nowadays. Well, however ripe a Beaujolais is it will be a relatively light style of wine, so the fruit will not totally overpower the palate. Instead it will leave space for acidity and those other flavours that are not fruit, but come across as more savoury – and indeed earthy or mineral. So the Crus have more poise, more depth and more elegance than the more basic wines because they have components competing for attention on your senses. It isn’t just red fruit, you also get some black fruit from time to time, the earthy and herbal mineral characters and yes sometimes that sense of granite or slate introducing savoury aspects and tension into the wines. Mont Brouilly, an extinct volcano, the soils are blue volcanic basalt. Right at the peak you can just see La Chapelle Notre-Dame-aux-Raisins. They are balanced and complete and yet again the truth is much more interesting than what we are normally told about Beaujolais. These wines can last. They don’t need to be drunk young, in fact just as with most good quality red wines a few years in bottle will settle them down and draw out the more complex and satisfying attributes. The things that actually make them good wines as to opposed more simple fruit bombs. I generally go around telling people to ignore vintage with most modern wines – for wines to drink anyway. Normally the freshest vintage is the one to go for, but obviously with classic red wines that is not the case and good Beaujolais, especially the Crus, must join that band of elite regions where vintage is a really important consideration. 2003, 2005, 2009, 2010, 2011, 2015 and 2016 are all brilliant vintages down in Beaujolais, with 2017 being great as well. There might still be some 2015 around in the shops and I would advise you to grab those bottles while you can. Less than 3% of the plantings in Beaujolais are Chardonnay and Fessy only have 1 hectare, but on this showing I cannot imagine why as this is a terrific wine. 100% Chardonnay with no oak but 6 months ageing on the lees. It has a lovely texture, satisfying mouthfeel, ripe apples and peach fruit and even a touch of something more exotic like pineapple and grapefruit. Lovely freshness keeps it poised and pure and the length is fantastic too. This is a really good alternative to anything at the more affordable end of white Burgundy – do try it if you can – 89/100 points. Available in the UK for £12.99 per bottle from Mr Wheeler & Hay Wines. Fessy only have 2 hectares of Morgon and so blend the Côte du Py with the Corcelles fruit. They believe the Côte gives the body and the other part gives the sumptuous fruit quality. I found this lifted, aromatic and very attractive. There was a seductive raspberry and smoke tinged perfume to it while the palate was silky and refined yet rounded and weighty with cherry strudel sorts of flavours and a crack pepper together with some lovely delicate structure from the refreshing nature of the acidity and the light touch of tannin playing around the finish. Fresh, lively and fruity for sure, but supple and concentrated too. – in fact the concentration and balance was a revelation to me – 89/100 points. Available in the UK for £12.99 per bottle from Fareham Wine Cellar. The abnormal character of the vintage really showed here with rich fruit that still shows that playful, fresh character. This was 80% destemmed with 6 months ageing in stainless steel tanks. The nose offered plums and violets, orange peel and that mineral earthy je ne sais quoi. The palate was full and ripe, succulent, juicy with a lovely, lively combination of red and black fruit, spice too and a touch of firm tannins. This was not so immediately about fun as the Morgon, there was a very serious, brooding wine lurking in there with an earthy, slate minerality, there was even a touch of Côte du Rhône about it. Great wine – 92/100 points. Available in the UK for around £15 per bottle from Crump Richmond Shaw,F L Dickins, Wine Utopia, Cellar Door Wines. I have always had a soft spot for Régnié as it was the last of the 10 Cru to be created and I remember where I was the day it was announced back in 1988. This was made from 40 year old vines grown on a single site at the base of Mont Brouilly. The Châteai itself dates back to 1706 and wine has been produced here for over 300 years prior to Henry Fessy taking over the management of the estate. As usual with Fessy 80% of the vines was destemmed and the wine was aged for 6 months ageing in concrete tanks. Lovely bright, but deep cherry aromas with a touch of something smoky and savoury. The palate had lovely weight, fruit density and concentration that made me really like this wine. There was lots of classic fresh red fruit, but plum and blackberry too. There was something wild about the wine at times that was most attractive and all the while a sense of tension, something taut, offset the softness of the fruit and was enhanced by the gently firm earthy finis – 90/100 points. Sadly I have experienced precious little Saint Amour in my life – on this showing it was my loss too. Fessy only farm 1 hectare in Saint Amour but they put it to good use as this was stunning and I was not alone in raving about it at the tasting. The wine showed its youth with milky, lactic notes and then a vibrant melange of red fruit, cassis and delicate spice notes. The palate was beautifully concentrated, but bright and pristine all at the same time. The fruit was just joyous and bright and well, downright pretty. It was supple and and ripe even though the winemaking esters were very apparent at this stage. There was a lovely supple, rounded, almost creamy texture and more tannin than you would expect, although it was not aggressive in any way, it just helped give the wine definition. One to watch I think- 91/100 points. By the way just in case you like to age wines, you can relax as these wines can age really well, from the great vintages anyway. At Lunch Laurent served us his 2009 Moulin-à-Vent and it was sensational. It had aged beautifully into a supple yet profound wine with silky tannins and concentrated earthy, savoury, light leather and dried fruit characters. In many ways it resembled a Gevrey-Chambertinn but with more sensual fruit and a slightly brighter nature. So there you have it, a little cross action of what one very fine Beaujolais producer does. These are wonderful wines that deserve to be taken seriously and enjoyed often. They would go with so many different dishes and be suitable for just about any occasion. Who knows perhaps the balance between concentration but not heavy, ripe fruit and freshness might be just right for now? Perhaps Beaujolais’s time has come? Laurent certainly felt that he was “taking Beaujolais back” and showing just what Beaujolais can be. The realisation may have struck me late in life, but there is no doubt that Beaujolais does make some lovely wines and I really must start enjoying them instead of avoiding them – and so must you.